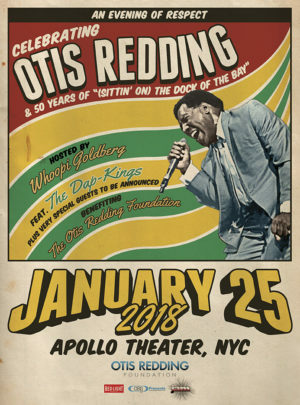 The Otis Redding Foundation is pleased to announce An Evening of Respect: Celebrating Otis Redding & 50 Years of “(Sittin On) The Dock Of The Bay” on Thursday, January 25th at the legendary Apollo Theater in New York City. The benefit show will be hosted by Whoopi Goldberg and feature performances by the Dap-Kings and very special guests. The event will feature a pre-show cocktail reception raising money for the Otis Redding Foundation. WHAT: An Evening of Respect will take place on Thursday, January 25th 2018, celebrating the 50th Anniversary of the release of ‘(Sittin’ On) The Dock of The Bay.’ Concert will feature performances by musicians that Otis both influenced and collaborated with during his legendary career. PLUS MANY EXTRA SPECIAL SURPRISE GUESTS THAT WE CANNOT ANNOUNCE!